Give your customers the flexibility of paying with a check, while gaining peace of mind with TeleCheck Warranty Services. 32 million Americans have checking accounts and no debit or credit cards. Clover™ Check Acceptance allows you to confidently accept check payments safely and securely while saving time and money by not having to deposit checks at the bank. Funds are deposited to your account within two banking days.Give your customers the flexibility of paying with a check, while gaining peace of mind with TeleCheck Warranty Services. 32 million Americans have checking accounts and no debit or credit cards. Clover Check Acceptance allows you to confidently accept check payments safely and securely while saving time and money by not having to deposit checks at the bank. Funds are deposited to your account within two banking days. Clover™ Check Acceptance utilizes TeleCheck's warranty service to guard you against check losses, so you can accept checks with confidence! 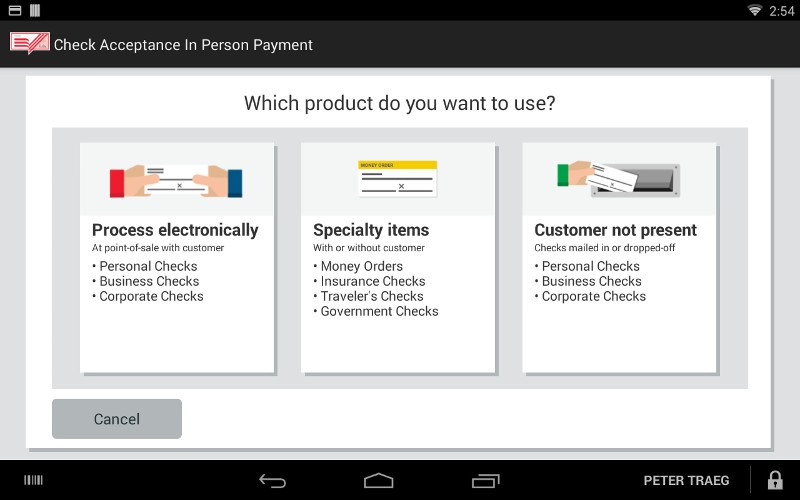 For some customers, paying by check is just more convenient. So don’t pass on a potential sale, especially one that’ll cost you less to process. With Clover™ Check Acceptance, you can electronically accept checks quickly and confidently. For some customers, paying by check is just more convenient. So don't pass on a potential sale, especially one that'll cost you less to process. With Clover™ Check Acceptance, you can electronically accept checks quickly and confidently.